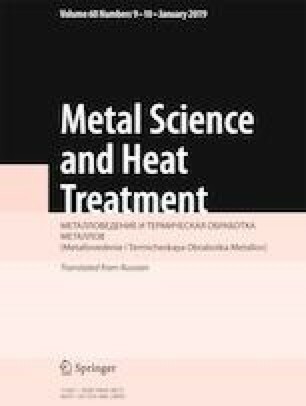 The conditions of formation of metastable Zr or Ti aluminides with Y under crystallization of superheated melts of the Al – Zr – Y and Al – Ti – Y systems with hypoeutectic and hypereutectic compositions with respect to yttrium are studied. Complex Al3(Zr0.67Y0.33) and Aln(Ti0.67Y0.33) aluminides with cubic lattices are shown to form due to crystallization of the Al – Zr – Y and Al – Ti – Y melts hypereutectic with respect to yttrium after superheating by 300°C above the liquidus temperatures. Translated from Metallovedenie i Termicheskaya Obrabotka Metallov, No. 9, pp. 14 – 18, September, 2018.